Here’s a movie I always recommend for Halloween but is put together so well and is such an original twist on a genre that badly needs a twist that there’s no need for you to wait for Halloween. Next time you’re looking for a movie that delivers some really thought provoking horror combined with some terrific acting you can’t do much better than PONTYPOOL. Former shock jock radio personality Grant Mazzy (Stephen McHattie) is now the morning announcer working in a radio station located in the remote Canadian town of Pontypool. Grant’s not exactly thrilled to be working in Pontypool but he’s got no choice since due to past outrages he’s virtually unhireable in the United States. Despite his efforts to confront, challenge and charm his listeners, his producer Sydney (Lisa Houle) orders him to stay with school closings and road conditions as that’s the stuff Pontypool residents really want to hear. But on one morning something decidedly different happens. Bizarre reports are called in of people acting strangely. They babble nonsense. They repeat words and phrases over and over. The people band into horrendously bloodthirsty mobs. People are killed. Property is destroyed. Grant, Lisa and their technician Laurel Ann (Georgina Reilly) can only listen as terrified citizens call the radio station to describe what is happening in the town. A happening that can only be described as a zombie outbreak. 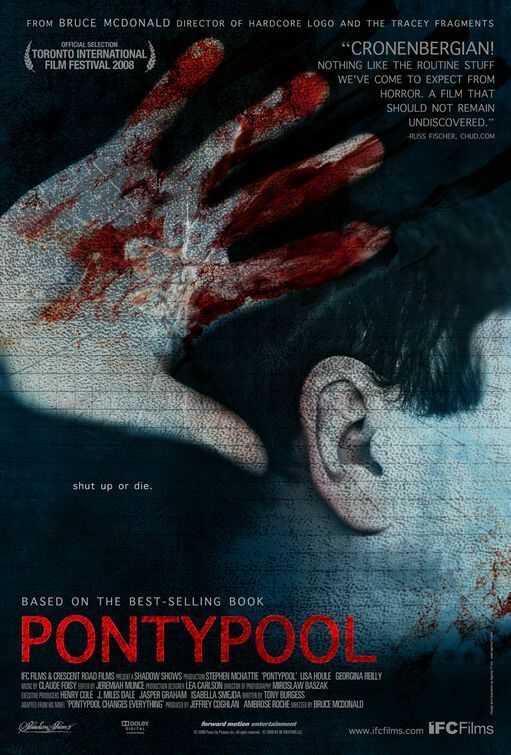 PONTYPOOL is that rare horror movie; one that totally took me by surprise and one that completely drew me in as I had absolutely no idea where this was going or how it was going to end. Even though the entire movie takes place inside the radio station we get a good idea of the carnage happening outside through phone calls from panicked citizens to Grant, Lisa and Dr. Mendez who are trying their best to deal with what is going on. And even after they figure out what’s going on, how do they communicate with the outside world to tell them without spreading the virus since they don’t know which words are infected? This new twist on the zombie idea is a welcome one and gives this material a freshness that is welcome to see. Stephen McHattie is terrific as the beleaguered Mazzy. Looking like Lance Hendrickson’s meaner brother with a whiskey-soaked voice he brings his A-game to the role and delivers in style. I guarantee that you won’t take your eyes off him while he’s on screen. Lisa Houle backs him up very well and it’s both inspiring and sad to see the course their relationship takes during the course of this incredible situation. There’s not a whole bunch of gore or wince inducing violence but that doesn’t mean that PONTYPOOL doesn’t deliver on the horror. By all means, if you haven’t seen it yet and you want to watch a zombie movie unlike any you’ve seen before, this is the one. Enjoy.